Manufactured here in the UK by Quirepace, the BVC Ti80 and Ti60 Centurion deliver longevity and performance wherever and whenever it is needed. Capable of handling the most difficult materials, BVC Centurion Industrial Vacuum Cleaners are designed to provide ultimate power and flexibility. 2.2kW and 4kW units can be supplied for 1PH supplies. Choosing a heavy duty industrial vacuum cleaner is all about performance, but that performance must be tailored to suit the application to guarantee satisfaction. Every application is different:- dust, grain, stone, sand, metal, wood, flour; whatever the material to be handled, careful adaption and specification of the machine is necessary to achieve the objective. Because we manufacture here in the UK we are able to tailor make every machine to our customer’s requirements. Specifying a Centurion machine starts with the motor – exhauster combination. Centurion uses a unique “multistage” exhauster. 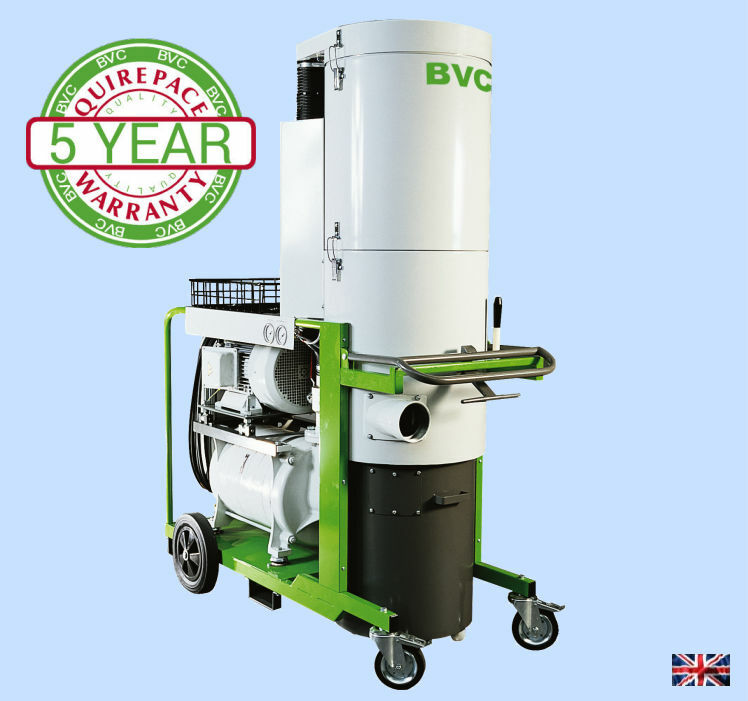 This unit, manufactured by Quirepace and part of the BVC range of exhauster modules, is different from the more common side-channel unit found on most machines. The multistage construction means that the unit is powerful and extremely robust. Should anything inadvertently get drawn in, the multistage construction is extremely resilient to damage through even quite large particles being drawn through the impeller. Most Centurion Industrial Vacuum Cleaners are fitted with powerful continuously rated 3ph induction (brushless) motors from 2.2kW to 15kW, but diesel and petrol powered alternatives are available. 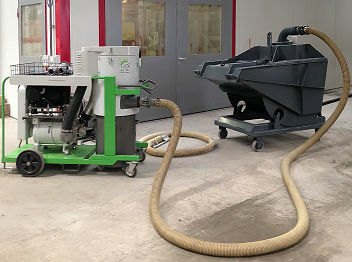 The powerful Centurion is particularly suited to cleaning tasks on construction sites and within factories where heavier materials such as concrete and brick dust must be recovered. The vacuum and cleaning performance can be manipulated through the motor-exhauster gearing, and via the type and diameter of hose that is used. As standard, Centurion offers options of 102mm 76mm 51mm and 38mm, and several hose types, sizes and lengths can be used on a single machine through adapters. The power to utilise long hoses in several diameters makes Centurion Ti60 and Ti80 ideally suited as agricultural vacuum cleaners for farm use. The large, easily emptied tank, combined with excellent filtration, and the option of wet pick-up (Ti60) delivers versatility and performance combined with the robustness all BVC professional vacuums offer. Centurion Industrial Vacuum Cleaners can be specified with several different filter types. When the Clearflow filter is specified, multiple filter socks are used within the filter module, providing high performance in a small space. A large filter surface area means lower speed airflow and less tendency to clog and block. Filter performance is maintained using the built-in filter shaker. Filters are designed depending on the application and material to be handled. There are options for HEPA filters, antistatic and PTFE coated fabric filters which help prevent debris sticking to them. Alternatively, fire retardant filters are available allowing hot material to be handled safely. With more and more emphasis being placed on dust control, selecting the correct type and class of filter is essential to ensure performance and safety are optimised. Centurion delivers the perfect balance between mobility and performance. The standard 60 or 80 litre drum can be supplemented with intermediate interceptors that increase capacity up to 3000 litres or more. Interceptors can be custom designed for each customer. Even though Centurion is a big machine, substantial handles, large locking casters and wheels and a heavy stable chassis mean that it is still maneuverable, even over rough ground. It is also designed to be lifted by fork-truck if necessary. The large capacity drum makes it easy to recover material for disposal or recycling. The drum itself has its own heavy-duty casters, an inbuilt lifting device makes emptying and exchanging easy, and a separate lift and tipping adapter is available for when the material being recovered is particularly heavy. Some things we don’t change – the substantial materials from which the Centurion Industrial Vacuum Cleaner is manufactured; the tough powder coated finish, and the proven components which deliver longevity and reliable performance. Centurion is virtually all metal, and designed for a tough life in tough envirionments. Some things we can and do change. In fact, this is what makes Centurion special. Our experienced sales consultants will guide you through the choices of motor, vacuum, filtration, hose dimensions and tools to ensure that the machine is perfectly specified for your application. Our factory in Fareham will build your machine to your specification, test it, and on delivery, we will commission it and carry out user training. If required we can make Centurion part of a fixed installation. The performance available is ideally suited to service multiple locations, either through a simple twin-hose adapter, or via extensive fixed pipework. As can be seen from the image below, Centurion can also be used with high capacity interceptors to increase capacity and performance. The flexibility of Centurion means that a single unit can be used both as a portable machine and attached to fixed pipework, depending on what is required at the time. When there is no electrical supply available a petrol powered vacuum cleaner may be the solution. 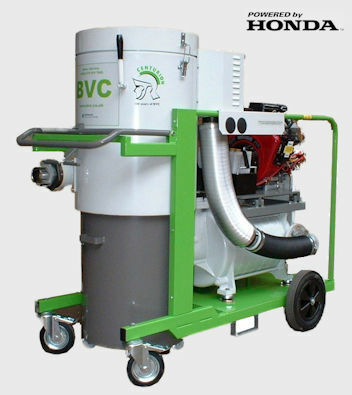 BVC Vacuum Cleaners, using proven BVC multistage vacuum pumps are available with petrol engines in place of electric motors. Quirepace can discuss any special requirements such as weatherproofing for outside use. Call us to discuss your particular requirements for petrol-powered vacuum cleaners. With a 5 year parts warranty and service available nationwide through our own service and maintenance department, Centurion is the optimum choice for all round value and performance. Centurion – Big Performance when you need it – Guaranteed.